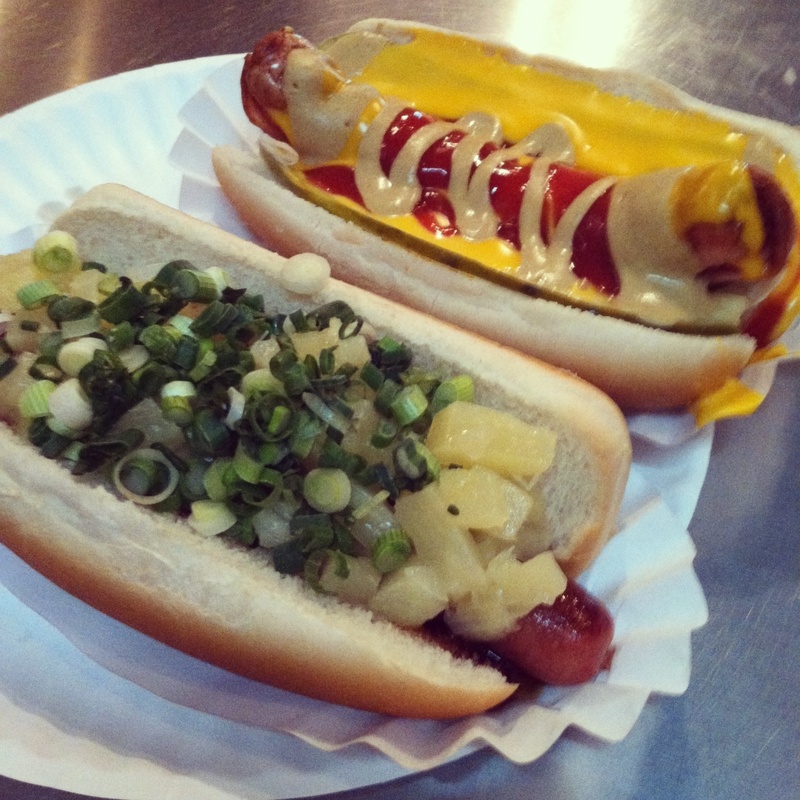 I am not really sure how, but I have managed to never go to Crif Dogs, a crazy hot dog shack in the village and Williamsburg. Through gaming the system, Sarah and I managed to procure a Groupon for $3 that gave us $28 worth of food. I would like to say now that both of those are not mine. The top dog is mine, a Crif Dog (beef and pork hot dog), which I then topped with mustard, ketchup, pickles, and melted cheese. In retrospect, I think I went a bit over the top, mustard and ketchup created a pretty gooey mess, and the bun was not able to support it. It was a fun treat, but it will probably be awhile before I eat another hot dog (at least until Nathan’s opens back up in Coney Island!). Sarah’s is the tsunami, a hot dog with teriyaki, pineapple, and green onions (it also comes bacon wrapped, but she opted for pork free). 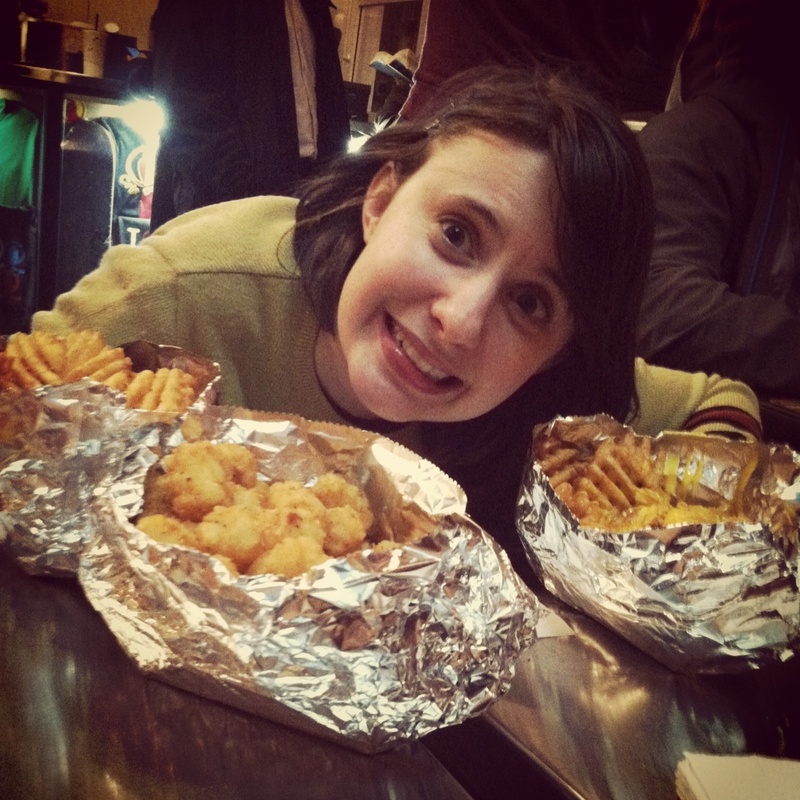 In addition to the hot dogs, we purchased an obscene amount of fried food. Hannah’s head for comparison. With four hungry people working on these, we still didn’t manage to finish tots, cheese fries, and regular fries. We might have over done it. I enjoyed Crif Dogs; it was a fun experience but not really somewhere I imagine I will go back to any time soon. I know I would take my hot dog loving friends, or stop by for a late-night-dog, but it probably won’t become a part of my Williamsburg cycle of restaurants.